Following last year’s Scouse Nativity it was never going to be an easy task, yet even with a different format this year, The Scouse Cinderella certainly held its own! Writer Kevin Fearon has unquestionably veered into pantomime territory this year with this show being far more interactive than usual, and whilst we didn’t quite get to “he’s behind you”, we weren’t too far from it! 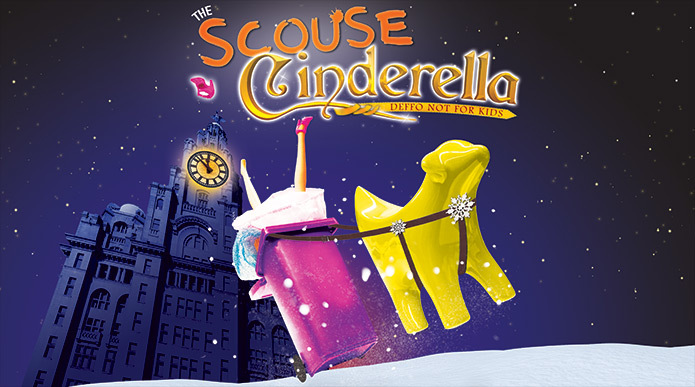 This riotous, adults only, journey through the story of Cinderella, albeit a Scouse version with Liverpool inserted in every possible way, included a political message, that of our local parks being sold to build new homes. Whilst the Royal Court’s Christmas shows are known for their political and close to the bone gags, this time the point was clearly a subject close to Fearon’s heart and he made sure his point was made, despite the gags. Cinders is played by the always delightful Hayley Sheen, who is accompanied by many of the usual faces on stage, including Paul Duckworth, Michael Fletcher, Stephen Fletcher, Lindzi Germain, Eva McKenna, Andrew Schofield and Keddy Sutton. Sutton certainly worked the hardest and was a great addition to the line-up. Comedian Germain was as effervescent as always, and Fletcher as Buttons almost stole the show again. However, this year it was the tacky, cheesy and boisterous 12 days of Christmas, sang by the two ugly sisters, that had the audience crying with laughter and entirely stole the show. The ugly sisters, played by Schofield and Duckworth, made the entire show so entertaining, and it was obvious they enjoyed it as much as we did! If you are in the mood for a bit of festive cheer and a sing along Santa Claus is coming to town … this is the show for you! Next Post: Attention: No rubbish, No plastic, in our seas and beaches!